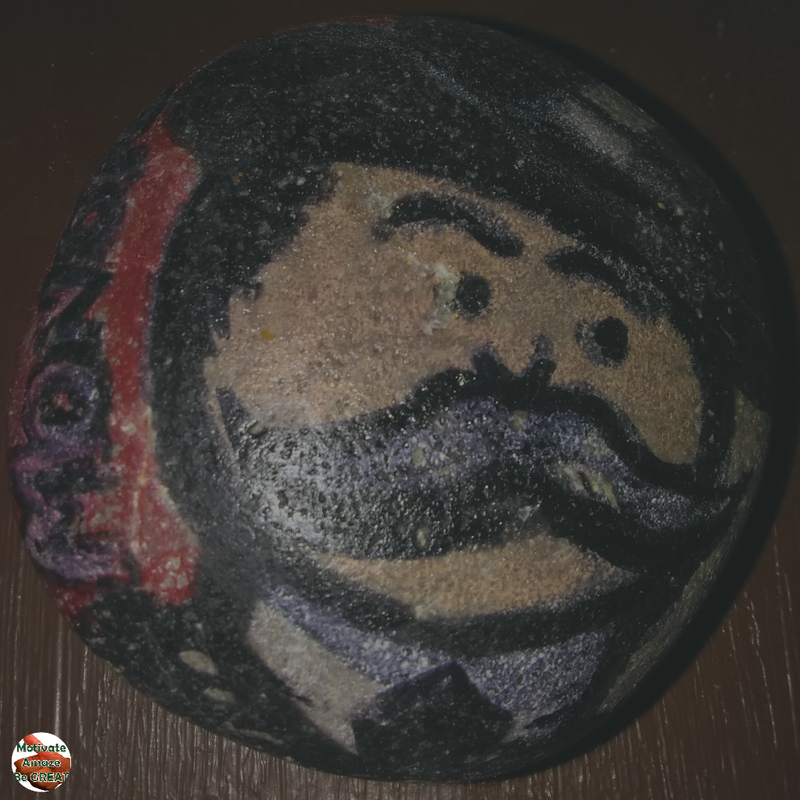 Painted Rocks: A Hidden Treasure For Inspiration - Motivate Amaze Be GREAT: The Motivation and Inspiration for Self-Improvement you need! They can be found anywhere and everywhere. So often we just pass them by and don’t give a second thought to the potential that exists from a relationship we can create with ordinary rocks. Yes, rocks have great potential! 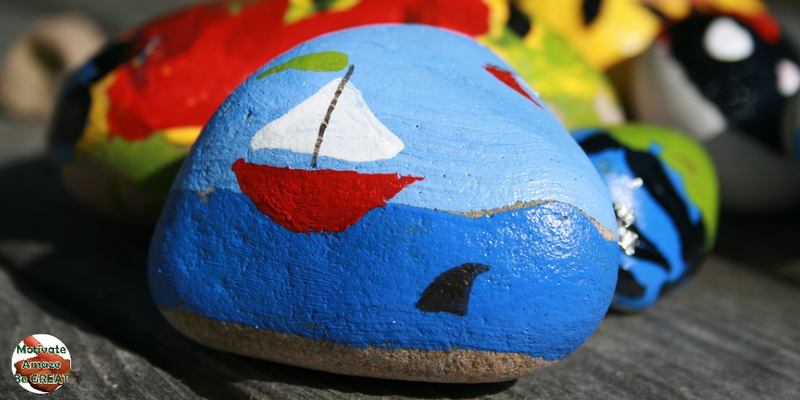 From serving as a canvas to having significant meaning for us, rocks can provide a sense of purpose, give us a reason to collaborate, and allow us to express ourselves during pivotal moments in our lives. I was hiking on a Saturday evening a few weeks ago. I didn’t want to go hiking due to my phobia with snakes and my friend was taking me to the mountain trail where rattlesnakes are residents and I’m not trying to step in their territory. I was also reluctant because, I admit; I’m lazy and rather eat. I knew that my hesitations were juvenile and decided to accept the invite and just go. I put the idea of looking for heart shaped rocks in my head as a way to give this hiking thing a sense of purpose for me. I had done this before with my children. We would get outside, take a walk, and look for unique rocks that maybe resembled something familiar or just reminded us of something distinctive. So long story short, I gathered 8 rocks that somewhat resemble hearts. I suspect that I decided on “heart” as being the shape of choice in my hunt, because the friend inviting me is also my childhood crush. I have been smitten about him since second grade. He thought it was silly as I kept my eyes glued to the ground during the hike. Needless to say, I collected them, took them home, washed them and decided to color them and make each one unique and add definition, turning them into painted rocks. I have them displayed as a nice memento of the occasion and it didn’t cost me anything. 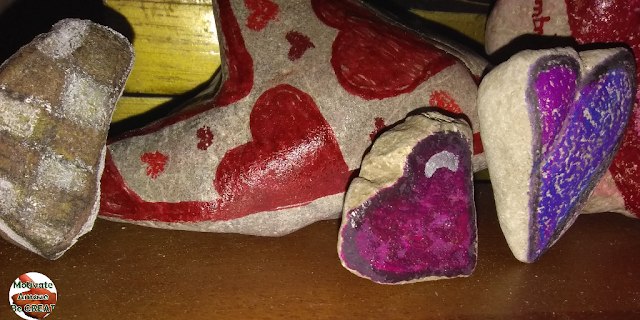 I’ve grown to appreciate more of the simple things, such as painted rocks, over the past few years. When financial burdens take hold and kids just stare bored expecting to be entertained, I figured rock gathering and decorating, was a nice way to get the family involved in an activity that could be done together. Now that I look back at the idea, rocks are the “take-a ways” to remember those cherished times. I’ve collected little round rocks that I painted into a ladybug family. 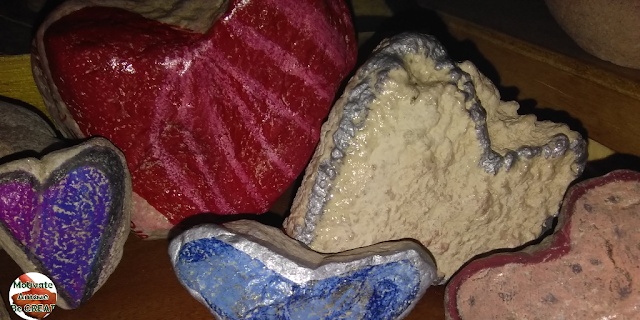 I’ve written song lyrics, quotes, jokes, and used them in all kinds of ways… from paperweights and door stoppers to centerpieces and labels; rocks have been instrumental in helping me when times get tough. If you search “rock art” on Google, you will find amazing creations. As you can see I’m no Picasso but I’d like to think I can get by making creations that don’t embarrass my kids too much. Rocks can serve as a gift when there isn’t one to afford. Depending on what you do with that rock it can be something meaningful if you intentionally want to express that. To follow up on that not so bad hike, I decided to express a sentiment from that day and wanted to do something that said I cared. I already sent him the first rock and when he received it, he chuckled and took it to keep as a memento. I’m going to give him a rock each time I see him until he has them all. I’m hoping he will get a hint as to how I feel and hopefully initiate a date or something. Worst thing that can happen is he’ll toss them aside somewhere and if that happens then I’ll accept it and simply move on. Based on his reaction to receiving the first one, I think he’s like what I did. It’s pretty neat to view this rock idea as a pre-screener to see if the guy finds meaning in simple things. Just as my kinds find the joy in rock hunting and making memories happen, so will the new guy in my life. He will have to be someone that can appreciate the simple things. Rocks are a hidden treasure I recommend discovering for you. Share this story with your friends and family, so they can get inspired, or, even inspire you with their own painted rocks.